On the afternoon of March 9, 1969, three guitar-and-drum-beating sisters from tiny Fremont, New Hampshire entered a tiny recording studio and emerged, just a few hours later, with a dozen original rock 'n' roll songs on some quarter-inch tape. These twelve songs were then pressed onto one thousand vinyl records, all but nine hundred copies of which immediately vanished forever off the face of the Earth. Within a year however, no less an authority than Frank Zappa declared that this album, prophetically entitled "Philosophy Of The World," was "better than the Beatles," and a decade after that the similarly inclined visionaries in NRBQ re-pressed "Philosophy..." briefly on their own Red Rooster label. Now then, if you've already heard either of these scarcer-than-rare items, then you're undoubtedly already a complete convert or at least a record collector with mighty impressive connections and very deep pockets. But for those thousands upon untold thousands out there who have not yet come face-to-face with The Shaggs, why, Now's Your Chance! For "Philosophy Of The World," with all of its original 1969 mix, sequence and even cover art lovingly intact, has been made available once again courtesy of the fine folk over at RCA Victor. It is, believe you me, the greatest album you have never heard. From its opening title track (so lyrically brilliant that there's a knee-deep moral lesson packed into each and every stanza!) through its garage-brand benediction ("We Have A Savior") thirty-one ear-boggling minutes later, "Philosophy..." is absolutely brimming with the sort of decorum-be-damned bash 'n' popping that such supposed heirs-to-the-genre as Half Japanese and even those Replacements couldn't ever come within a hundred thousand miles of emulating. And how could they or anyone else for that matter? For The Shaggs, as their daddy-slash-producer-slash-drill sergeant Austin Wiggin, Jr. wrote at the time, "are real, pure, and unaffected by outside influences. Their music is different; it is theirs alone." Indeed. Sure, a cursory half-listen suggests only a trio of inept-at-best gals trying to differentiate their fingers from their toes, musically speaking that is. Yet a closer examination instead reveals some fiercely detailed and down-right ingenious compositional skills beneath all of the Neanderthal strum und drumming (for example, one should note how flawlessly Dorothy Wiggin's lead guitar ghosts her melody lines during most every song, in true Muddy-Waters-by-way-of-Peter-Tork fashion). Dorothy's lyrics too run raging gamuts between nervous nursery rhyming ("My Pal Foot Foot") on the one hand hand, to downright teen-righteous pontificating on the other ("Who Are Parents" makes J. Lennon's subsequent post-primal natterings appear pretty darn Romper Room by comparison, while "Things I Wonder" and "Why Do I Feel?" actually reel towards near Brian Wilson realms of agoraphobic self-analysis). And "Sweet Thing," with its more than touching timelessness vis-a-vis that ol' love-gone-wrong thang, makes one wonder if the Wiggin sisters didn't have a battered copy of "Another Side Of Bob Dylan" hidden under their bedroom dresser all along. But this / that being the Swinging Sixties -- and The Shaggs playing House Band at the prestigious Fremont Town Hall for roughly the entire Nixon Presidency -- there's lotsa slap-happy, good olden rock 'n' roll littering "Philosophy Of The World" as well: "That Little Sports Car" (the only Shaggsong, by the way, to feature the mysterious fourth Shagg, Rachel, on bass) is wholly, happily, ham-fistedly frug-worthy despite drummist Helen Wiggin's never-less-than Beefheartian ways with a tempo lurch. Plus "What Should I Do?" would not sound one note out of place upon your favorite Lesley Gore or even, dare I say it, Shangri-La's platter (dig Dorothy's put-down of some Fremont stud-about-town: "He's a two-face, he's a disgrace, he never wins a race" yeah, you go grrl!). So, while it may be all to easy to file this album alongside your Wild Man Fisher or even Weird Al rekkids (personally, I place The Shaggs somewhere between Sun Ra and Dino, Desi & Billy), it simply cannot be denied that "Philosophy Of The World" is one of the greatest musical, uh, curiosities to ever be created by man or even beast. And I for one am glad that this true, blue cultural treasure may FINALLY be getting the chance it's so long deserved to make a lasting and loving imprint upon what remains of our socio-musical consciousness. 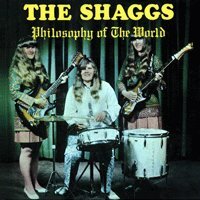 So GOD BLESS THE SHAGGS, then, and Please buy at least two copies of their album immediately, won't you?